So on July 23rd we found out we're having a girl!! Two of the ultrasound photos are on this web page. Heather's Mom kept saying it was a girl I guess she was right after all. Heather's excited because she thinks girl clothes are cuter then boy clothes. Heather's been keeping her eye out for good deals on baby clothes and managed to buy several outfits for pretty cheap. I guess Heather has an eye for the sales. Anyway, it sounds interesting, this thing called life...in this case a new life. 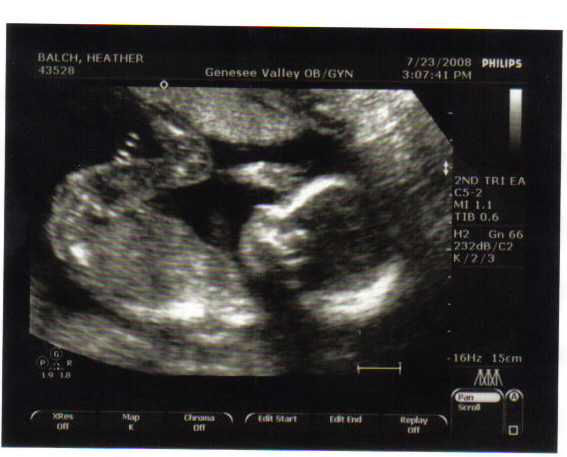 It's simultaneously exciting and nerve wracking to think that I'm going to be a Dad. I think this is one of those life experiences where you just have to wade in and do your best. There certainly is no training manual for raising children. Hopefully they don't end up hateing you in the end.